This BUSN20016 research in business assignment we have discuss on marketing, management, accounting, economics and finance. This course has been purposefully designed to incorporate a high degree of flexibility relating to various topics; therefore the choice of topic for your project is entirely your own choice. 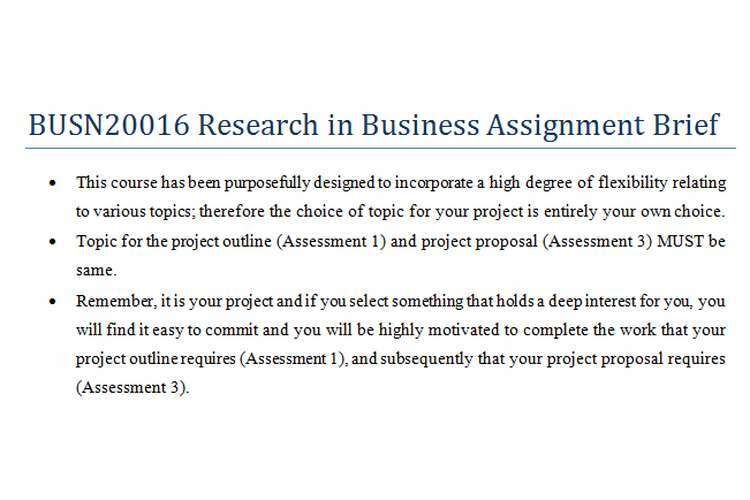 Topic for the project outline (Assessment 1) and project proposal (Assessment 3) MUST be same. Remember, it is your project and if you select something that holds a deep interest for you, you will find it easy to commit and you will be highly motivated to complete the work that your project outline requires (Assessment 1), and subsequently that your project proposal requires (Assessment 3). Make sure that your topic is relevant to your current area of study or what you want to be in future. There is often temptation to pick a topic that is too broad, and might require a longer time to do it properly. Up to five topic areas are given below under five broader areas of interest (i.e., discipline). We strongly suggest you to choose a topic from one of the broader areas. However these are not the exhaustive list and you can choose beyond this list. Marketing communications: such as why do some controversial marketing communication work whilst other fail? Social marketing: such as why are social networks more persuasive than traditional word-of-mouth? Factors affecting product marketing: How can countries use national culture to help them promote major exports? Enterprise management: such as how can an organisation (any industry) engage with and facilitate the creation and growth of new ventures, including opportunity identification and evaluation, venture capital, and/or corporate venturing; and what are the processes for managing and improving the success of the enterprise? Corporate governance such as how can an organisation (any industry) cope with environmental, social, and ethical influences upon their practices and processes of doing business; including environmental sustainability, corporate social responsibility, stakeholder management and influence, and business ethics? Managerial accounting: how can managers use accounting information to make better decisions? You should choose your own project topic and then briefly write a problem statement followed by aim and objectives and a brief methodology of the project. In addition, as a part of topic presentation, all on-campus students are required to discuss their project topic and ideas during the tutorial sessions in front of other students. You are also expected to provide constructive feedback on one of your classmates' project. Distance students will do the same activity in the online discussion forum of the course Moodle site. Assessment 3 requires the preparation of a full project proposal that should contain: a statement of the problem, research aim and objectives, justification and potential output of the research, conceptual framework and research hypotheses, methodology and organisation of the study.